The below interview is from February 2008. A lot has changed since then, but we thought it would still make for interesting reading and so we have reporoduced it on this new version of SnowJapan. Last month I sat down with Mr Andrew Lea, otherwise known on the Forums as SJ-Andrew, and more importantly the creator of SnowJapan and still the man in charge of the operation. Over the years we have had many people ask us about SnowJapan and I took this opportunity to ask him a few questions about the site, how it got started, it's history and future. Please can you tell us a bit about your background. I was brought up near the town of St. Helens in the north-west of England, about half way between Liverpool and Manchester. I studied Management & Business studies at the University of Liverpool and after graduating went on to work in marketing at a subsidiary of General Motors in Leamington Spa, Warwickshire. After getting my Diploma in Marketing and starting my first real management position after two years, one day I saw an advertisement for the JET Programme in the newspaper. I remember the advertisement said something like "Do you want to live and work in Japan for a year?" For some reason I just felt that I really wanted to do it so I applied for the job, went for the interview in London and eventually got the position. I arrived in Japan in late July 1992. It was only a few weeks before I left for Japan when I found out that I would be living and working in Yuzawa town, Niigata Prefecture. At that time I had no idea where Yuzawa was, but the person I was replacing did a really good job in sending me her thoughts about the job and also some information about Yuzawa, so that helped a lot. I found out that Yuzawa was known as "Yukiguni" (Snow Country) and famous for being the setting of the Nobel Prize winning novel of the same name by Yasunari Kawabata. I was to be based at the Junior High School in Yuzawa. It looked fantastic and I was really looking forward to the prospect of living in a ski town. From the moment I arrived in Yuzawa, I was treated really well by so many people and I have many wonderful memories of that time. I remember when my parents visited in 1993, the mayor of the town along with about thirty of the top officials put on a huge party at one of the main hotels in the town. My parents will never forget that. For the last 10 years I have lived in Shiozawa (which is now part of Minamiuonuma-shi), just to the north of Yuzawa. Had you ever skied before you arrived in Yuzawa? 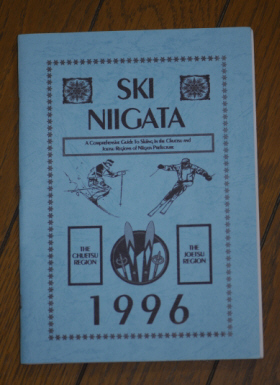 Actually, no - my first time skiing was at the Mitsumata (Kagura) resort in Yuzawa in December 1992. I remember really looking forward to it but on that day it was snowing heavily and turned out to be a bit of a disaster. Looking back I don't think Mitsumata is really the best place for a first-time skier! But I soon got into it and in that first season I think I put the gear on and hit the slopes over 80 times and in the first four years I must have been out about 300 times. I spent a lot of time at the Kagura, Naeba, Iwappara and Kandatsu resorts, with lots of night skiing at Iwappara, Yuzawa Park and Yuzawa Nakazato. So what happened when the JET job finished? Originally the plan was to just take a year out from work and then return to the job in the UK, but I was really enjoying the experience and quickly decided that I wanted to stay in Japan longer. I decided to try to learn Japanese properly with the rather vague target of getting back into business using that skill either in Japan or back in the UK. That first year quickly became two, then three. After the three years on the JET Programme, the town took me on as a private AET (Assistant English Teacher) and I stayed in Yuzawa for that fourth year. I remember getting a little restless with it all though as I really wasn’t a teacher and I wanted to try and get back into the business world but I just didn’t know quite how to do it. It was around that time when the General Manager of the new NASPA New Otani Resort in Yuzawa called me and asked if I would like to help out teaching the staff some basic English. After finishing up teaching in Yuzawa and over a period of about a year I did some private work and I also started doing some work for NASPA. During that time I got to know the General Manager very well and we became good friends. He was very keen on getting foreign guests to visit the hotel and when he found out that I had a background in marketing we talked a lot about ideas on how to do that. After a while I was offered a part-time job at the resort and within a year that became a full-time position. They created a new position for me called International Marketing Manager and involved me in the management meetings at the resort. My job was to get foreign guests to NASPA and as they didn't really know how to do that I had almost free reign on how to go about it. To start out, all I had was my computer and the Japanese pamphlet for the resort. I decided that a simple website would be a cost-free way to get information out and they also agreed to create a simple English information sheet that I could use. As NASPA is part of the New Otani hotel chain I spent some time on sales calls in Tokyo based at the Tokyo New Otani and tried to spread the word about the website. Since I arrived in Japan I thought that with so many great ski areas, it was a real shame that there wasn't any information available in English. 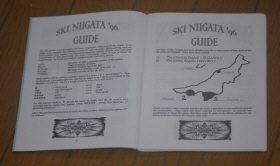 So during my fourth year as an AET I put together a printed guide called "Ski Niigata". 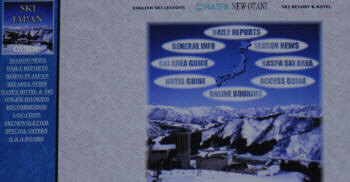 The booklet was a 64 page guide to the resorts in the Yuzawa and Myoko areas of Niigata prefecture that I had been to. It consisted of some general information about the ski resorts in the area, some travel information and a page with a review of each of the ski resorts in the region. 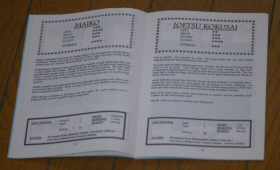 That guide was distributed to more than 200 AETs and other foreigners living in Niigata at that time. The response was very positive and it was reprinted the year after, with the Niigata Prefectural Office helping with distribution. I didn’t know at the time, but I suppose that was the first step. With almost no budget to work with, a big part of my strategy at NASPA was to create a website for the resort and try to get people to see that. I have been using computers since I was at school and had some experience in programming & design and so I really enjoyed learning how to create simple web pages. This was back when there were still few websites and they looked very simple with lots of gaudy flashing gifs and all! 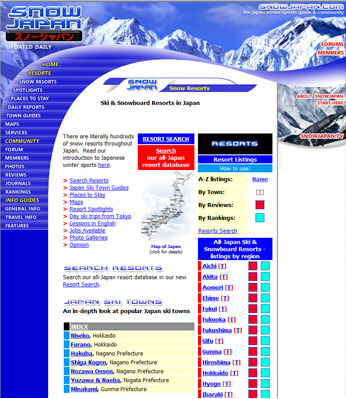 During that learning process I started making another simple site called "Ski Japan Guide" (later rebranded as SnowJapan) which was in effect an online - and very amateur looking - version of the Ski Niigata booklet that I had previously made. The site started getting hits and from there I just gradually kept on adding to it over a period of two or three seasons until it had some basic info on most of the resorts in Japan. Sometime during that period when I was working for NASPA I was contacted by a UK-based group of companies called Iponics who were looking to create a company in Japan as well as other Asian countries. To cut a long story short, in 2000 I teamed up with Iponics to establish Iponics Japan and became the Managing Director of the new company. The website became part of the company and that was when we were really able to start putting some investment into the site. What does Iponics Japan do? There are two main parts to our business – web design/marketing projects and the development and operation of SnowJapan. The web design projects we undertake are predominantly English language sites for Japanese companies or Japanese language sites for UK clients. As part of my work I also undertake some marketing activities in Japan for a few major Tourism Associations in the UK. My time is generally split between the two sides of business, though the relative workload of each changes throughout the year. Yes, quite a few people ask us about that. The SnowJapan operation is unique in a few ways I think. Going back to the beginning, the site was not created as a means to making money – it was basically just a hobby and me putting information out there about Japanese ski resorts when I had time. While obviously the operation now is much bigger, much more costly to operate and there are financial considerations, in some ways the site continues to follow a similar kind of concept. As a long-term policy we invest in developing and improving the site rather than putting the effort into having a sales force go out to sell something of less quality. Each season we sit down and discuss how we might develop the site over the coming six and twelve months. Many of the things that we discuss and eventually develop are comments and suggestions that readers and members send in to us. These comments always help us focus on what people want to see on the site and what might be best for the site moving forward. The considerations are always initially what would be great to have on the site rather than what might bring in more revenues. Of course, there are financial considerations but we have rarely developed something simply because it would bring in money. I believe that creating a quality site that attracts a lot of traffic and ever-increasing audience will also attract potential advertisers anyway. That is what we have observed in the last few years as more businesses realise the value of being listed on our site. Each season the percentage of advertisers who renew is close to 100% and we often hear clients telling us of the very positive results that come with having a presence on SnowJapan. 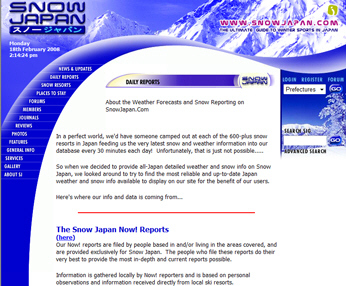 Another important fact is that because of SnowJapan we have gained quite a lot of web design work. So in effect SnowJapan acts as a portfolio for the other side of our business and because of that we are able to maintain the concept of being independent and do not feel pressured into making the site overly commercial. It’s a balance that we would like to keep. What can you tell us about the SnowJapan operation? That isn’t actually an easy question to answer because it is often changing. But to give you an idea, basically I’m almost always at least on hand and do the majority of communications with clients. As I created the site, it will always be very important to me and I am protective of it. I am however now much less hands-on with the day to day running of the site and Forums than I used to be by necessity. "SJ David" and "SJ#4" are always involved. From April until November last year I had two programmers and one graphic designer working full time on SnowJapan related work, with an extra designer working for a period of about three months. Then throughout the year we have a programmer and a designer on hand. There are other people who contribute to the site in various ways, including the people who post the daily "Now" reports during the season. As we are part of a web design company that is part of a larger organisation of sister companies, we can actually be quite flexible in terms of the number of people (and skill sets) that we can employ at any time. What's your relationship with Japanese snow resorts? I do what I can to try and develop long-term and positive relations with an increasing number of Japanese snow resorts. Some are interested in appealing to the foreign market and are positive from the first time you talk to them, others take a fair bit of work while some are just not interested - and I do often understand the reasons for that. In my experience resorts are at least initially quite wary of actively promoting themselves to the foreign skier and snowboarder. This is either due to a lack of confidence (they just don't know how to go about it) or because of some problems that they might have encountered in the past. If a resort does show an interest in appealing to the foreign market, we will do what we can to help and advise them. The same goes for hotels who wish to be listed on our site, though an increasing number of those are foreign owned. I do a fair number of presentations to regional ski resort associations and tourism associations in Japan on the topic of 'the foreign market' and it is generally encouraging to see an increase in interest. It is sometimes surprising to me which resorts are interested, and at the same time which resorts are not. It often comes down to the person who is working in "Marketing" and their personal thoughts on the subject. Unrelated to winter sports, I am involved with JNTO (Japan National Tourism Organization) and am a member of their Advisory Committee which meets regularly to discuss issues about foreign tourism in Japan and the Yokoso Japan campaign. I often bring up the topic of winter sports at those meetings. SnowJapan has grown a lot each season and there must have been a lot of changes. Are there some things that have not changed? I like to think that the basic concept of what we are doing is unchanged from way back when I first started it - that being that the site is 'the independent guide to winter sports in Japan'. By independent I mean that we’re not trying to sell any particular region or any particular tours, ski resorts or hotels. Some people ask us why there are more hotels listed for the Niseko and Hakuba regions than other areas. The reason for that is very simple - those areas are extremely popular and there are a lot of hotels who want to be listed on our site. If other hotels in other areas wished to be listed all they need to do is contact us and we are active in trying to expand the regions represented. It’s important that our daily "Now" reports are objective and 'tell it like it is'. It's important that whatever relationships we have with resorts, hotels and related companies, they do not have any say on the direction or content of the site (though we do listen to and consider comments and suggestions). At times there are outside pressures to change the way we run the site, but I strongly feel that the 'independence' of what we do is one of our strengths. This is also one of the reasons why we tend to stay out of some of the 'local politics' that are so prevalent in some places.... it is best that we not become involved in such things and keep one step back. What can you tell us about marketing of the site? We are very active in a number of ways - mostly web-based and also providing information and interviews to sites, magazines and newspapers for use in articles. We often get mentions in pieces that we only find out about once they are published as well. We do a lot of web-based activities to spread the word about SnowJapan. With our large readership, a lot of people also get to know about us via word-of-mouth. While I am very keen on SnowJapan being well-known, and will do what I can to maximise that, I'm much less interested in being well-known personally so you won't see photos of myself or my colleagues on the site or plastered over articles anywhere. What interesting changes have you seen since you came to Japan re: the winter sports scene? There have been lots of changes. I remember when I first came to Yuzawa in 1992 I lived near the Yuzawa IC and on a Sunday afternoon the queues to get back on the expressway started at 1pm on a Sunday and didn’t clear up until 9pm. Now you very rarely see anything like that. I also remember waiting in a line for 50 minutes for one of the lower pair lifts at Naeba. Resorts were so crowded back then, it's sometimes hard to believe when you compare it to recent years. That's good for skiers of course but less good for the businesses running the resorts. Some of the resorts I have contacts at tell me of overall numbers being less than 30% what they were 10 years ago. I remember when snowboarding was really starting to take off here as well. In Yuzawa I think at first there was only one resort that allowed snowboarders (Yuzawa Park). Now it's the other way round of course very few resorts restricting snowboarder access. As the total number of Japanese on the slopes continues to decrease every year, the last few years has seen a noticeable increase in foreigners on the slopes at major resorts. I'd like to think that SnowJapan has been one of the reasons for that increase. In operating SnowJapan I do have a lot of contacts with resorts and tourism associations in Japan and as mentioned above it is interesting to see the gradual increase in interest in the foreign market. Many resorts have noticed what is happening in Niseko and wonder if it might be possible elsewhere - or even if they would want that to happen at their resort. Change might be predictably slow and there are still a lot of resorts that are simply not interested, but things are definitely changing. I remember seeing Niseko become this huge story overseas in the early years of SnowJapan. From my viewpoint, in so many ways Hakuba of the last two seasons reminds me of that Niseko situation and it will be interesting to see how things develop over the next few years. A few more questions to finish on. How many Japanese snow resorts have you been to? I think I've been to 106 Japanese resorts now. The majority of those are in Niigata, Nagano and Gunma. I really want to get up to Hokkaido again and explore the Tohoku region more. I won’t go as far as declaring a favourite, but some of my best days skiing have been at Nozawa Onsen, Kagura and Shiga Kogen. There are just so many fantastic places in Japan, we really are spoilt for choice. I really enjoy visiting different resort areas rather than spending long periods in one area and every year I try to make sure that I visit at least three new places. So what about the future of the site? We’ll be continuing to develop the site - there'll be no slowing down. There will always be a lot of things to do as it is never 'finished'. In recent years we have been launching new functionality all at the same time before the snow season starts, but I think this year might be different. Last year we took on a particularly large amount of work, way more than we had done before. This year we are already working on some modifications and new things and I think that you will see changes and modifications going online throughout the year rather than all at once. How can people help support SnowJapan? If people want to help support us, the best way to do that is to upload photos to SnowJapan, write Resort Reviews, upload videos if you have them, post on the Forums and generally contribute to the site. By contributing to the site you are not only helping keep the site current and making it more useful for other readers, but also effectively supporting us. So we are always happy to see new content going up. Please do keep them coming. Not everyone has photos and videos, of course, but just using the site and telling other people about SnowJapan is a big help to us. The more people that visit and get involved the better. Links into SnowJapan from other websites are always appreciated - so if you have somewhere to put a link to SnowJapan and are happy to do that, please do! Also, if you contact a business that is listed on SnowJapan - hotel, tour company, resort, etc - please mention SnowJapan when you contact them... it all helps. I just want to thank people for using the site and especially to those who have contributed over the years. If you ever have any comments or suggestions, please do feel free to contact us (editor@snowjapan.com) at any time - many of those ideas end up being part of the site. We'll continue to develop SnowJapan and hope that you'll stick with us. Thanks.